On my way to the Conventa Crossover in Ljubljana, I was writing my column for an event magazine in the Netherlands. At that time, I didn’t know that in the next two days I would be a guest in your beautiful and inspiring Puppet Theatre and how relevant my column would be for you in Slovenia as well. 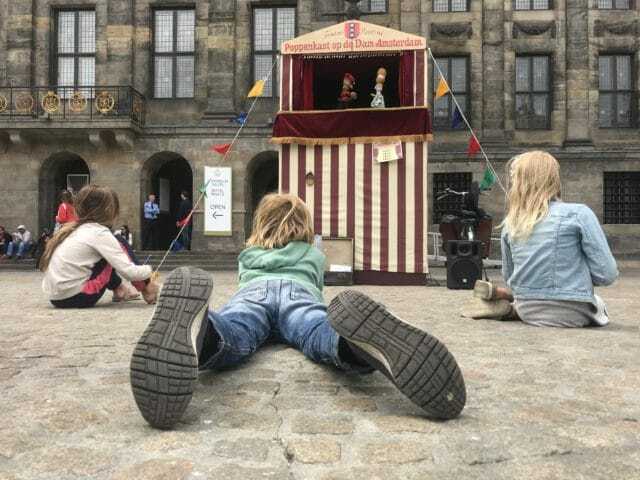 The puppet show on Amsterdam’s Dam Square is celebrating its birthday. This attraction has now existed for 125 (!) years, and over that period has captured an indispensable place in the hearts of many. Among them is my 7-year-old son Goos. I see him lying down, stretched out on the square’s hard Amsterdam cobblestones, completely absorbed in the adventures of Jan Klaassen and his wife Katrijn. History confirms what my son Goos already knows: that Jan Klaassen and Katrijn Pieters actually did exist, and still do. They, too, were once real people made of flesh and blood. They probably lived on the Franse Pad (now known as Willemstraat), and I like to imagine that they led a life full of squabbling. The first paintings of the Dam’s Royal Palace, when it was still under construction (dating from 1650), also show the puppet show on the square. But the first ‘permit’ wasn’t granted by the Amsterdam city council until 1893. Since then, the puppet show has taken place on the Dam continuously, regardless of the weather. But why does this tradition seem to endure? Why hasn’t it disappeared into oblivion? Or even worse, been swallowed up into one of the mobile apps that ‘the kids today’ are increasingly being offered? Why does it still appeal to the imagination? Is it the clumsy wooden puppets that have traditionally been made out of whatever materials are on hand? Is it the storyline? Or the wonderful performance of puppeteer Egon Adel? Is it the setting on the Dam, the people, the open air? Does the stately decor of the Royal Palace still play a significant role? I don’t think so. But what I do know with 100% certainty is that this historical spectacle ‘communicates’. In the best Latin tradition of the word ‘communicare’, it brings together people sharing a common experience. An experience that cannot be explained logically, but that is still overwhelming. The whole ‘spectacle’ goes straight into our brain stem (our unconscious), which is where creativity, emotion, and feelings lie in wait, until they are awakened by a puppeteer on Dam Square. The whole spectacle on the square is at odds with our cortex, which is where rationality, logic, and arguments compete for the most attention. Because the cortex in children is not yet fully developed, children spend the first years of their lives experiencing things purely through feelings and intuition. And we look on jealousy as children make us long for that time when our own signals were purely emotional and immediate. That’s why I’d like to call on people to go en masse to Amsterdam’s Dam Square. To take a seat on the small stones that poke under your spoiled bum, which is so used to luxury office chairs, and briefly feel like a child again. Let your imagination run free. Allow for amazement and surprise. It will do you, and our profession, good. Previous articleThe 6th edition of MeetingPlanners Russia ready to start in Moscow!